Dmitri Ivanovich Mendeleev (7 February 1834 - 20 January 1907) was a Russian chemist who became known as one of two scientists who created the first version of the Periodic Table of Elements. On 6 March 1869, a formal presentation was made to the Russian Chemical Society, entitled The Dependence Between the Properties of the Atomic Weights of the Elements, he stated that the elements were arranged in a pattern which allowed him to predict the properties of elements yet to be discovered. J. Palisa discovered asteroid #182 Elsa. The Astronomical Society of the Pacific held its first meeting in San Francisco, California, with Dr. Edward S. Holden, director of the Lick Observatory, as its founder and first president. M. Wolf discovered asteroid #415 Palatia. J. H. Metcalf discovered asteroid #739 Mandeville. K. Reinmuth discovered asteroid #909 Ulla. Konstantin Petrovich Feoktistov (7 February 1926 - 21 November 2009) was a Soviet cosmonaut and space engineer. He graduated from the Bauman Moscow Higher Technical School as an engineer, and received a doctorate in physics. He joined Mikhail Tikhonravov's OKB (design bureau), and in 1955 formed part of the team that designed the Sputnik, Vostok, Voskhod, and Soyuz spacecraft under the leadership of Sergey Korolev. Dr. Feoktistov also worked on a design for an ion powered spacecraft capable of taking humans to Mars. In 1964 Dr. Feoktistov was selected as part of a group of engineers for cosmonaut training, and was assigned to the multi-disciplinary Voskhod 1 crew. His training for further space missions was cancelled for medical reasons. 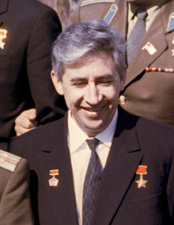 Dr. Feoktistov continued his space engineering work, and became head of the Soviet space design bureau that designed the Salyut and Mir space stations. As of 2003, he was deputy head of the mission control centre at Baikonur. Dr. Feoktistov passed away on 21 November 2009 in Moscow. O. Oikawa discovered asteroid #1584 Fuji. Tupelo, Mississippi began receiving power under the first TVA contract, signed 27 October 1933. It is contracts such as this which are expected to ultimately fund the space program proposed by The L5 Development Group. K. Reinmuth discovered asteroid #1720 Niels; and S. Arend discovered asteroid #2084 Okayama. K. Reinmuth discovered asteroids #1481 Tubingia, #1674 Neveld and #2022 West. A Cessna 172 was landed in Las Vegas after 65 days in flight, accomplished by refueling in the air, setting an endurance record that still stands. USSR launched Cosmos 140 which had orbital data similar to a manned flight, a possible precursor to the 23 April flight of Soyuz 1. USSR launched Luna E-6LS No.112, initially identified by NASA as Luna 1968A. The intended Lunar orbiter mission failed when the spacecraft did not achieve Earth orbit. Luna E-6LS No.112, initially designated as Luna 1968A by NASA and tentatively identified as an attempted launch to reach Lunar orbit, was launched 7 February 1967 on a Molniya-M 8K78M carrier rocket with a Blok-L upper stage. The rocket and spacecraft failed to reach Earth orbit when the rocket ran out of fuel 524.6 seconds after launch due to a fuel valve or inlet becoming stuck during third stage flight. In their preliminary assessment, NASA remarked that "presumably the Luna probe itself was equipped similarly to the later Luna 14 probe." Subsequently released information revealed it was a 1,700-kilogram (3,700 lb) Luna E-6LS spacecraft intended to enter Lunar orbit to study the Moon and demonstrate technology for future manned Lunar missions. At the time the world's largest telescope, a 600 cm instrument began operation 40km from the village Zelenchukskaya in the USSR. USSR launched Soyuz 24 to dock with the Salyut 5 space station. Soyuz 24 was launched 7 February 1977 to dock with the Salyut 5 space station. The main objective was to investigate the atmosphere on the station to see if it was toxic and had an effect on the crew of the Soyuz 21 contributing to the problems they had at the end of their flight: The crew of Soyuz 21 had experienced psychological and physical problems during their stay on the station, thought to be mainly due to their becoming emotional, not following physical training, and developing an unreasonable desire to return to Earth. However, there was also speculation that some fuel had leaked into the living areas. This prompted the Soviets to design equipment that could be used to completely change the air of the station by releasing compressed air to create a breeze and venting the contaminated atmosphere through the airlock. The Soyuz 24 cosmonauts entered the station wearing breathing masks because of the possible contamination, but they found that the station atmosphere free of any toxins. It was decided to perform the venting experiment anyway to prove it was possible in case of any need in the future. Air was released from the forward end of the station while simultaneously being replaced from storage tanks in the Soyuz 24 orbital module. The main purpose of the mission appears to have been to tie up loose ends left by the precipitous departure of the Soyuz 21 crew. They loaded the Salyut 5 Earth-return capsule with samples and film, which detached the day after their departure from the station, and was recovered 26 February 1977. The Soyuz 24 crew also conducted Earth observation and materials sciences experiments, but their planned EVA was cancelled because of the venting exercise. Soyuz 24 was short by space station standards, less than 18 total days, with its landing on 25 February 1977 36 km northeast of Arkalyk, Kazakhstan. The Soviets said, however, that it was a busy and successful mission, accomplishing nearly as much as the earlier Soyuz 21's 50 day mission. The Soyuz 24 flight crew was cosmonauts Viktor Gorbatko and Yuri Glazkov. NASA astronaut Bruce McCandless II became the first human being to fly untethered in space when he exited Challenger during the STS 41-B Shuttle mission and maneuvered freely. Astronaut Robert L. Stewart then joined him in a similar MMU test. The USSR Salyut 7 space station, with Cosmos 1686 (a modified TKS ferry) attached, burned up in the atmosphere over Argentina during re-entry. USSR launched Cosmos 1686 on 27 September 1985, a modified version of the cancelled TKS manned ferry, which docked with the Salyut 7 space station. Officially, the flight was for testing the equipment, assemblies and design components of a satellite in various modes of flight, including joint flight with the Salyut-7 station. All landing systems were removed from the VA re-entry capsule and replaced with military optical sensor experiments (infrared telescope and Ozon spectrometer). The spacecraft burned up in the atmosphere together with the Salyut 7 station over Argentina on 7 February 1991. It re-entered with an unused 3 meter diameter recoverable capsule of 2-3,000 kg mass, solid rocket motors, and cesium sensors. NASA launched the Stardust Mission as a coma sample-return mission to rendevous with comet Wild 2. NASA launched STS 98 (Atlantis, 102nd Shuttle mission) for the International Space Station Flight 5A mission, which delivered the Destiny Lab to the ISS.